We are located in the heart of the Vail Valley, known for world-class skiing, shopping, dining and other mountain activities. 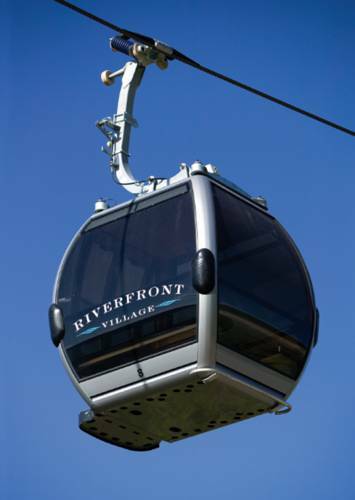 We offer direct access to skiing via the Riverfront Express Gondola out our back door and stunning views of Beaver Creek. We offer a 27,000-square-foot spa complete with mountain-inspired services and natural ingredients - plus a lap pool and three Jacuzzis, a gym with cycle and yoga/pilates studios and state-of-the-art equipment and activities for all ages. Our guest rooms feature mountain-modern d cor with simple lines, rich fabrics and warm colors. Room types provide a choice for every guest: Traditional, Studio or One, Two and Three-Bedroom. Custom kitchens and fireplaces are found in all suites. Maya Modern Mexican Restaurant: Internationally acclaimed Chef Richard Sandoval has created an approachable menu for Maya, a modern Mexican kitchen and tequileria. Traditional recipes meet contemporary techniques, resulting in dishes and cocktails with authentic Mexican flavors. The Lift Cafe: The Lift Cafe's comfortable, all-American menu features a wide variety of delicious burgers, sandwiches, soups and salads. A kid's menu, market essentials & dinners to-go are also available. The Lookout: The Lookout serves gourmet pub fare made with locally sourced ingredients for fresh & vibrant flavors. Starbucks: Our full service Starbucks is the perfect spot to grab a handcrafted coffee, latte, Frappuccino, espresso, smoothie or tea. Starbucks also serves grab & go breakfast & lunch items including pastries, sandwiches & Panini. Amenities Ordering: Order a treat to your or your loved ones room! Options include incredible wines, delicious snacks, cocktails, and gift certificates.